Jane Abbott knows that she's nobody special, so instead of looking for romance she's hunting partridge in the Maine woods when a plane crashes into a nearby pond. Diving in to save the pilot, Jane instinctively gives him air by way of a lifesaving kiss, and leads him to safety through a barrage of gunfire. The handsome stranger returns the favor by kidnapping her. Clearly no ordinary man, and insisting Jane's life is in danger, Mark spirits his stubborn guardian angel to an aircraft carrier in the Atlantic Ocean. Only then does she discover that the mysterious Mark is actually Prince Markov Lakeland. Soon to be crowned king of the young country of Shelikova, can Mark persuade Jane that she has what it takes to be his queen? 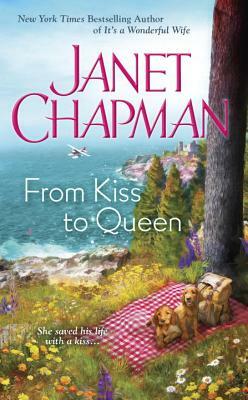 Janet Chapman is the New York Times and USA Today bestselling author of contemporary and paranormal romance novels, all set in the state of Maine, where she lives with her husband, surrounded by wildlife. Best known for her Highlander series, including Tempting the Highlander and Loving the Highlander, and her Spellbound Falls series, including The Highlander Next Door and Courting Carolina. Janet also has several contemporary series set on the coast and in the mountains. When she’s not writing, Janet and her husband are camping, hunting, fishing, and generally rubbing elbows with nature.